Primal Kitchen Primal Fuel Review: A Winner In My Book. 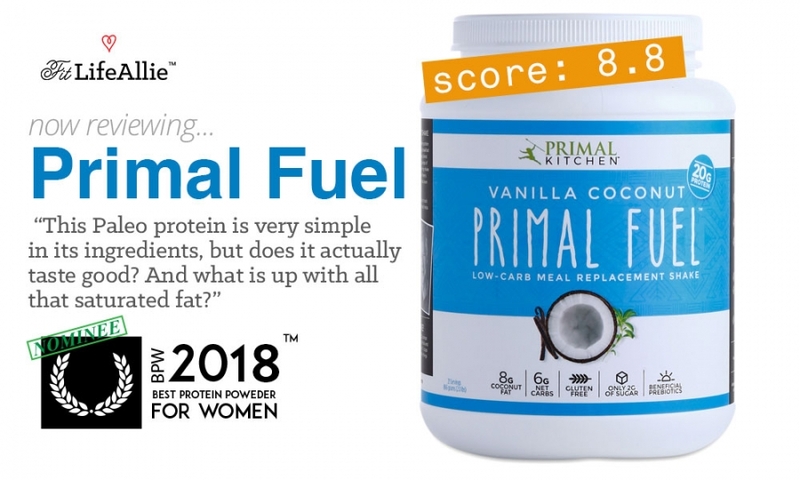 Primal Kitchen Primal Fuel Reviews aren’t that tough to find as one of the biggest, if not THE biggest ‘PALEO’ brand continues to gain prominence. Today I’m going to tell you all about this Primal Kitchen Primal Fuel. And I mean ALL about it. I’m going to tell you what the best flavor of Primal Fuel is, and also talk to you about the formula, and what’s actually in this paleo protein powder. I’ve had quite a few of you ask me about Primal Kitchen in the past few weeks so I’m pretty stoked that I’m finally getting a chance to dive into this review. If you’re ready to do this, why don’t we jump on in. Let’s let our inner beast out and start this Primal Kitchen Primal Fuel Review. Primal Fuel is an interesting product. It is sold as a meal replacement that is very keto-friendly and can be taken in place of an actual meal. So in that sense, you might be thinking that this shake is somewhat like Shakeology, but in fact that is not the truth. This protein shake from Primal Kitchen is NOTHING like Shakeology or any of the other meal replacements that you’ve seen. Primal Kitchen Primal Fuel is actually a very BASIC version of the meal replacement. It has just a handful of ingredients. Why don’t I list them out here and then we’ll keep talking about whether or not I think this Primal Kitchen Paleo protein is a viable alternative to the classic meal replacements shakes. What’s in Primal Kitchen Primal Fuel? And that’s literally it. I know. I was thinking the same as you that a meal replacement usually has SO many ingredients. Not so much the case here. The thing is, that the Paleo ‘meal’ is so minimalist to begin with. I mean. You can’t hardly eat any carbohydrate. No starch, no grains. It’s very restrictive. So in that sense I can see why the Primal Kitchen Primal Fuel is so minimalist. There is a lot of protein from the whey, and a lot of fat from the coconut milk. I do like the formula because it’s so basic. Overall I’ll give the Primal Fuel formula a B plus. It’s simple but fits the paleo diet nicely. Let’s talk about the flavors now. What’s the Best Flavor of Primal Kitchen Primal Fuel? I tried two flavors of this protein powder. The Chocolate Coconut, and the Vanilla Coconut. It’s funny that they both use the coconut flavor as PART of the actual marketed flavor. I mean. They basically had to since there is so much coconut milk in this product. I don’t mind it though. I love coconut. Especially with rum. Lots of rum. Lol. But no let me tell you about each flavor and tell yo my favorite. The best flavor of the Primal Kitchen Primal Fuel is the Chocolate Coconut. I know that sounds like a weird flavor to some of you but just trust me this flavor of paleo protein powder is quite tasty. I love how this flavor has really really deep, true chocolate flavors that you don’t find in some of the other more traditional protein powders. You can tell Primal Kitchen went above and beyond to give their Primal Fuel a more authentic chocolate flavor. The coconut adds a nice smooth sweetness to the chocolate to make for something that is very smooth-tasting. I think this flavor COULD benefit from a LITTLE more sweetness but none-the-less I’ll give this flavor of Primal Fuel a solid 8.5/10. The second-best tasting, and I suppose therefore the worst tasting flavor of the Primal Fuel protein powder is the vanilla coconut. I didn’t dislike this flavor by any means (pardon the double negative), but it’s the truth that the chocolate was better. The vanilla just wasn’t as strong as a flavor in my opinion but it also was very drinkable and smooth. I thought the coconut came through more as a prominent flavor in this arrangement with the vanilla and even this flavor could’ve used more sweetness to be honest. But. To conclude, again, my preferred flavor of Primal Kitchen Primal Fuel is the chocolate coconut. Okay. Let’s talk packaging now. Primal Kitchen Primal Fuel Packaging is Pretty Nicely Done. The Primal Kitchen packaging tells you a great deal about the product within. It is not the loudest, or most ‘in-your-face’ packaging on the shelf, but it is simple, effective, and gives you the impression that the product is well-made and of high quality. And that’s really a common theme throughout the Primal Kitchen products. They aren’t flashy, but they stay true to the Paleo diet and lifestyle and do a nice job presenting all the essential information of the product. I like that the vanilla flavor is blue while the chocolate flavor features a darker brown color background. The font selections that Primal Kitchen chose are really beautiful in their own hand-drawn way. They really match the sort of ‘rough-around-the-edges’ vibe of the Paleo diet and they make a big difference when you think carefully about how tasteful fonts can really add to your product label. Primal Kitchen clearly understands this well. There’s a large flavor graphic on both flavors, featuring a coconut alongside the supporting flavor (chocolate and vanilla). The last thing that I’ll call out about the Primal Kitchen Primal Fuel label is the nice message by Primal Kitchen founder Mark Sisson on the back of each package. It adds alot to the product when you have that human connection and I think it brings a level of trust and comfort to the consumer. So overall it’s a job well done on the packaging. I’ll give it an A-. Ok let’s wrap up this Primal Fuel Review.